The Australian Owlet-nightjar is a small nocturnal bird that is found over much of Australia. They mostly hunt for moths and other insects, using their large eyes to see in dark. Despite their tiny beak, they have exceptionally wide mouths. While they are nocturnal hunters, they will often sun themselves during the day when sitting in roosting holes in trees. 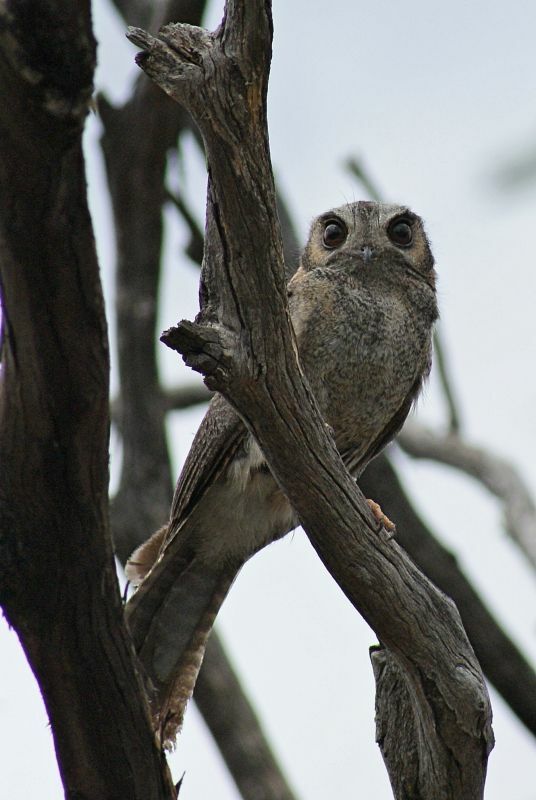 They are the smallest of the night-hunting birds in Australia at 21-25 cm.This species is the only Australian representative of the Owlet-nightjar family, with the rest occurring in Papua New Guinea and other Pacific islands. The owlet-nightjars are related to the frogmouths and nightjars, but the exact relationship is still uncertain with some evidence also pointing towards a common ancestor with swifts and hummingbirds. 1: Gluepot Reserve, SA, 13/11/2011.